Barry’s unusual Speedster blood attracts the unwanted attention of vampires. The vampires are later apologetic to Barry. AU set in the 4th season. Story includes: blood, some hurt/comfort, macabre humor; original vampire characters of color, especially in later half; short forays into real-world topics. And some fluff. If this interests you, read on! It started in an abandoned warehouse district at night, as things seem to do. Barry was dealing with a Metahuman of the Week. As he zipped around to capture the Meta, Barry’s arm grazed an errant bit of metal frame. The metal snagged and tore; an ounce of Barry’s blood escaped the cut from his arm and splashed to the ground. Barry hardly noticed it. What Barry did notice, however, was a distinct sensation of being watched. As Barry wrapped things up at the warehouse, an uneasy feeling crossed his nerves. Still holding a cuffed and grumbling Meta, Barry frowned as he peered at the indistinct shadows and jagged shapes of the dark warehouse. His breath hitched - in the far shadows, a pair of eyes were watching him. They were not human eyes, or even the flicker-green eyeshine of a cat. No, these were eerie white-blue irises, set against the dark. They brought to Barry’s mind the the stark eyes of grackles he had seen at the park. 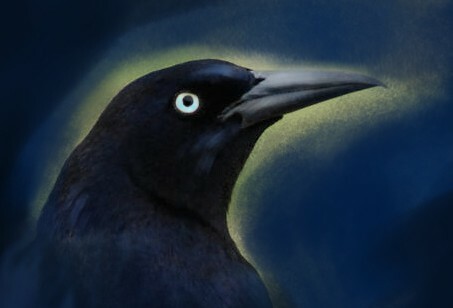 Although these eyes looked like they belonged to something much larger than a corvid bird. The eyes blinked, then flickered and disappeared. Moonlight poured out from behind clouds and filled the warehouse, showing no one at the far end. Barry frowned. After a few moments of hesitation, Barry flashed away from the warehouse to deliver the trouble-causing Meta to the Central City Police Department. Back at STAR Labs, Barry de-suited and the STAR Labs team traded banter about the evening’s mission. Barry started to note how he had felt watched and possibly seen eyes. Unfortunately, the moment was overshadowed by Cisco, who had been checking Barry’s suit. Cisco pointed to the incriminating tear on the sleeve and irately demanded to know what Barry had done to the suit. Caitlin switched into medical mode and immediately started examining Barry’s arm. Said owner of the arm protested that the cut was nothing and had already healed. Iris peered with brief concern at Barry’s arm, Harry went back to typing on his laptop, and the evening wrapped up at STAR Labs. No one connected the drops of blood that Barry shed and the appearance of white-blue eyes in the shadows. Iris and Barry had talked about having some relatively normal, quality time together. Things were quiet at STAR Labs and CCPD, and Iris and Barry finally took a half-day off. Their impromptu afternoon plan was an outing to a nearby nature preserve -- low-key and just the two of them. Barry flashed back to their shared apartment to pack water and a few things. Iris was stopping by Central City Picture News to briefly talk to a former colleague; she would be arriving at the apartment a little later. The doorknob rattled faintly. Iris was surprisingly quick, it seemed, with getting back. “Iris?” called Barry, as he went over to unlock the door. Following Barry’s glance, Iris looked down at her clothes. Iris was wearing a zippery, dark-leather, punk-rock sort of ensemble. For some reason, an expression of panic flitted across Iris’s face as she looked back up at Barry. “Uh,” tried Barry, “It’s got style. Very punk. You’ve definitely hit a punk aesthetic. But, um, we should probably change before we hit the North Woods trails.” He held up the hiking pack in his hand, cheerfully. “Oh. Gosh. Erm. Yeah, it was… so much. Actually, a cuppa -- I could really use a cup of tea.” Iris put her bag down on a table. Iris seemed like she was babbling a little, which worried Barry. Juggling a variety of teas, Barry looked up at Iris. Iris was staring at him, apparently in astonishment. “My god, Zeekey was right about you,” she breathed, to herself. Barry wasn’t sure who Zeekey was or what this meant. He put the collection of teas the counter. After a moment, he carefully picked out the Soothing Camomile tea. Barry clattered around the kitchen, grabbing two mugs, filling them with water, putting them into the microwave and punching in some heating time. “Wait, you’re making tea in the microwave? ” said Iris, sounding oddly aghast. Barry looked at her, his lips slightly parted with an unasked question. By now, he was out of the kitchen, still holding the box of Soothing Chamomile. Finally, Barry said, “Well… I don’t think we have a tea-kettle. Do we?” His gaze lingered on Iris reluctantly, as if he was asking a different question entirely. But he finally glanced around the apartment, as if there really was an unboxed kettle on a shelf somewhere. Something did catch Barry’s eye, but it wasn’t a tea-kettle. He found himself staring at the large dressing mirror in their apartment. Because it reflected back two people. One was Barry, of course. Next to him, in the mirror, was a woman donned in punk-rock gear. But she had disheveled black curly hair, brown skin and a face nothing like Iris’s. The strange woman was now staring at the mirror too. In the reflection, Barry could see the woman’s eyes widen while she mouthed, “Oh, shi-”. Barry forced himself to turn back to… to what was probably not Iris. For a moment, the two people stared at each other, Barry’s mind just starting to race through permutations of possibilities as to what was happening. Just then, the microwave beeped loudly, jolting Barry and making the woman half-jump. Her Iris-face shifted like a mask and then abruptly turned into the real face of the woman in the mirror. Barry stepped back involuntary at this, the box of tea tumbling out of his hand and spilling on to the floor. The woman seemed to realize her disguise had completely unraveled. She cursed out loud, then muttered what sounded like “Oh hell oh hell I’m so bloody BAD at Glamour” . Barry registered, in passing, that she had some kind of British accent. The woman was crouching slightly, looking jittery, her eyes darting quickly around the apartment and at Barry. And then the woman grabbed Barry’s hand and bit him. Barry yelped in surprise, twisting his hand away from the woman. He stared at the bite mark on the back of his right hand, then looked at the woman. She seemed shaken -- which was ridiculous to Barry, as she was the one who’d attacked him. The woman had screwed her eyes shut and was rubbing at her mouth with her hand and sleeve, trying to rid her mouth of blood. His blood. Then the stranger opened her eyes -- and her eyes... flickered. The woman’s brown irises flashed to sharp-white irises, so stark that they stood out against the pale sclera of her eyes. Grackle-eyes. Her irises flickered back to brown, then white again. And her teeth, as she tried to wipe at them -- her eyeteeth were not quite right. The woman shut her eyes again. This time, when she opened her eyes, her irises stayed brown. Barry started to flash away, to grab something to immobilize the woman. But to his surprise, he juddered, stumbling awkwardly back into real time. The woman stopped trying to wipe her mouth and instead stared at Barry in surprise. And then looked at him with cautious curiosity. “...I thought it took longer for people to be affected like this,” said the woman, studying Barry with open curiosity now. The woman stepped toward him. Barry stumbled backwards. His body felt like it was suddenly cocooned in lead, not listening to him. He bumped into his couch and fell on it, sprawling awkwardly, unable to properly move. The woman watched Barry. She absently wiped at her teeth, one last time. Her eyes flashed those sharp-white grackle-irises again, the white color settling longer in her eyes this time. She shook her head distractedly, as if to clear out thoughts from her head. Barry felt an uneasy, rising feeling that was quickly turning to panic. He realized his breaths were becoming unsteady, and he forced himself to breath normal, deep breaths. Barry followed the woman with his eyes, as she retrieved her bag. That bag wasn’t Iris’s usual bag either. Why had Barry thought she was Iris at all -- ? From her satchel, the woman removed a kit with small bags, envelopes and paper - similar to the kits Barry used in his CSI work. As an afterthought, she also donned gloves. Was there-- CSI stuff happening…? Barry thought in bewilderment. The woman looked around, as if trying to decide something. Her eyes settled on Barry finally. She hesitated, then gave a small shrug and walked back to him. As he tried to push himself away from the woman, Barry discovered his muscles were now completely paralyzed, except his involuntary systems. And his eyes, which he could still move. Barry watched as the woman reached over... and plucked a few hairs from his head. The woman folded a piece of paper around the hairs. She brought out a large paper evidence bag, a small plastic ziplock-like bag and a glassine envelope. She looked between the three items several times, like she wasn’t sure which one to use. Finally she chose the plastic bag and stuffed the paper and hairs into it. Barry felt a stab of annoyance cut through his panic. Being paralyzed on his own couch was bad enough. And now, he was being forced to watch a live-action version of CSI: Amateur Hour, starring the sketchiest person ever. Who didn’t know how to correctly package samples. For all her awkward over-explaining, Barry thought irritably, this person didn’t make much sense. Also, she was leaving out all the important information, including who she was and why she was collecting hair samples from him. Meanwhile, the woman peered at Barry. Her brows furrowed. “Also, why aren’t you at work? I thought you spent all your time at work.” She looked like she wanted to hoist off a few more complaints on to Barry about how inconvenient he was. But instead, the woman shouldered her bag and stood up as if to leave. Some blood had escaped the gash. A droplet traveled down his skin with a faint tickling sensation, leaving a thin red trail. The woman stared at the droplet of blood, openly enthralled. Sharp, bright white flecks appeared in her irises, glittering. This time, the woman shook her head violently, squeezing her eyes shut and scrubbing her face using her arm. But when she opened her eyes, her eyes still flickered with white shards. The woman studied Barry. She absently bit at her lip. Her eyeteeth were definitely noticeable, now. She looked at her satchel again, as if trying to decide something. Finally, with an abrupt movement, she dug into her bag and drew out another kit. This one had vials and needles. The women’s brown eyes, as she glanced at Barry again, kept flickering into solid white irises. Barry had a bad feeling about this. Quick update: Aw, thank you for the kudos! They brighten my day. So my plan is to post a chapter or two of this story every day for the next week (through next Monday). After that, I'll space out chapters -- perhaps post them in batches, during the next couple of weekends.